The Bharatiya Janata Party (BJP) announced it’s manifesto for the 2019 general elections. 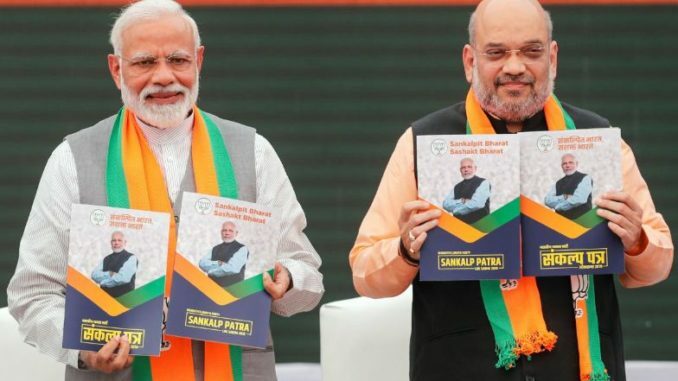 The manifesto “Sankalp Patra” was revealed by the Prime Minister Narendra Modi, party President Amit Shah, Finance Minister Arun Jaitley, Foreign Minister Sushma Swaraj and Home Minister Rajnath Singh. One of the key aims of the BJP’s manifesto is to make India a developed nation by the year 2047, 100 years after independence. The called it’s manifesto, ‘Sankalp Patra” and it has 75 promises to celebrate 75 years of Independence. During his address Narendra Modi, urged the people of India to “hold them accountable” if the promises aren’t fulfilled. “We want people to hold us accountable. Hence, we have set out 75 goals to achieve by 2022,” Mr. Modi said. Apart from this, the BJP promised assistance to states under their international outreach program for economic development. The BJP repeated some old unfulfilled promises like eliminating Article 35A, Article 370 and Ram Mandir. The party once again promised that it would make efforts to ensure the safe return Of Kashmiri pandits and also provide financial assistance for the resettlement of refugees from West Pakistan, Pakistan occupied Jammu & Kashmir and Chhamb. The party promises if voted to power, the party promised to implement a housing scheme under which pucca houses (permanent houses) will be provided to every family by 2022 that is living in kuchha houses (huts) or has no access to housing. The BJP manifesto also promised that it would launch the Jal Jivan mission, a special programme that addresses the water crisis in the country. This will also include the Nal se Jal scheme which promises piped water connection to every household by 2024. Further, the BJP maintained its promise of reserving 33 percent of seats in the Parliament and state assemblies for women if it returns to power, the bill in fact has been pending in parliament for over a decade.